Now that you are ready, it's time to fire up WED and begin creating our first level! Your WED interface should look something like this image - meaning it's completely empty. This tutorial will use the default button skin of Gamestudio/A7. If you need to modify your workspace, the configurations can be changed under File / Preferences. Ensure that WED has the Snapping function enabled under File / Preferences / Options / View Options / Snapping as this allows us to create a solid level that will also be compiled and rendered faster. Create a new level by clicking on File / New . Four new windows called view windows will become visible and the rest of the toolbar becomes active. Get into the habit of saving your files as often as possible to prevent data loss. File / Save the project as level1.wmp under your work folder. We can now begin adding blocks to our level. We will start by creating a house primitive that our player will start in. Navigate to Object / Add Primitive / Misc / House to create the primitive. When you first create the primitive, you would be correct in saying that it looks very small. We can adjust this by using the Mode / Object Scale tool to increase the dimensions of it from any view window. Once you have adjusted the house dimensions, try moving the house around the level with the Mode / Object Move tool and adjusting the orientation (or rotation) with the Mode / Object Rotate tool. 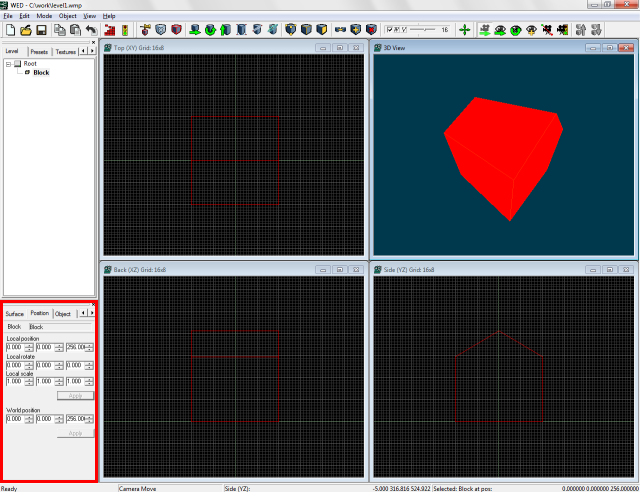 Alternatively, you can modify an object's position, orientation, and size in its Object Properties panel denoted by the red box in the above diagram. You can adjust your camera view in any of the view windows using the tools within the View Toolbar. If you lose focus of your level, pressing the [Home] button on your keyboard will reset the camera position for all four view windows. !! It is good convention to have your level aligned with the center co-ordinates as it makes it easier to reset your view if you ever lose focus. Following this convention also ensures that your level is always within the build boundaries, renders at optimal speed, and prevents calculation inaccuracies which can lead to collision problems and incorrect texture positions. In this case, make sure our house is lined up to the center co-ordinates with the base of the house just sitting on the horizontal plane. One last thing to take note of is the Status Bar at the bottom of WED. This toolbar provides us with important information about the engine's status, active tool, active view window, mouse coordinates, and active object with its position. When manipulating the position, orientation, or size of an object, the Status Bar will provide us with the value or degree it is being changed by. Great! Now we have a fine shape for our house. But wait, we forgot something! Right now our house is only a solid block which won't allow us to add any visible content to its interiors. We will have to hollow it out which will create walls, a floor, and a ceiling for the primitive we have loaded. This can be achieved by selecting the object and applying Edit / Hollow Block. WED can perform this operation on any solid primitive. The command creates walls in the shape of the selected object and groups them together for us. This means that the primitive still retains its shape, but its integrity becomes hollowed. Knowing that, it's time to give our house a proper appearance with textures! Gamestudio's WED offers a standard set of textures archived into a file called a WAD. We will use this file to apply textures to our house's walls. We first need to add this file to our project before we can start using them. In the Project Pane of the level, navigate to the Presets tab and you will notice a listing of directories that our level uses to determine the location of its assets. Right now, we are only interested in adding a textures file to our level which is achieved by right-clicking the Textures Folder then selecting Add WAD. 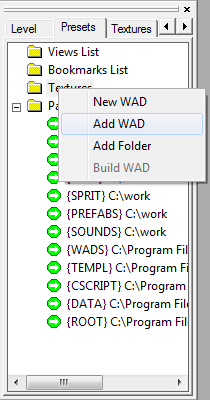 A file browser window opens and by default, you should see a file named standard.wad, which is located in the wads directory of your Gamestudio's installation directory. 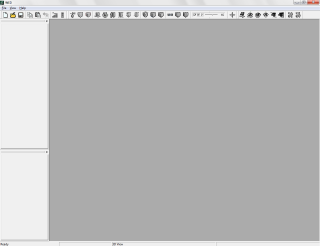 Once you have added this file, you should now see its filename under the Textures folder in the Project Pane. Navigate to the next tab called Textures in the Project Pane and expand the heading named standard.wad to reveal the contents of the WAD file. 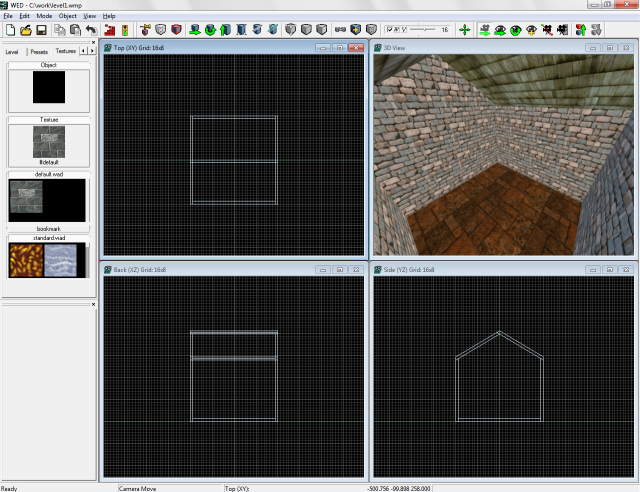 We're now ready to start adding textures to our house! As described earlier, when a primitive is hollowed, a series of walls are created in the shape of the object and are grouped together. We have to be able to view each of these blocks individually if we want to apply different kinds of textures to them. Select the house and press the Scope Down button to bring us down to the house's scope level where we can now modify the individual wall components composing it. Apply different textures to the walls of the house by selecting a block followed by a corresponding texture from the standard.wad file. After you have finished, don't forget to Scope Up again! Your house might look something like mine at this point. Excited to see what our house looks like now? Select File / Build Map to compile our level! The [>>>] button opens the compiler and lighting options, but leave everything is at its default setting for now (if it isn't, click Default Settings to make sure). Then click [Ok]. After a successful build process, click File / Run Map and [Ok]. A new window should open which gives us the basic capabilities to navigate around our level using the arrow keys and right mouse button. Our house doesn't look like much now, but it's a start! At this point, feel free to add interior elements to the house. !! Remember to always rebuild your level after you have modified the environment in any way.